About 60% of the body’s magnesium is found in our bones and teeth and it plays a key role in the transmission of nerve impulses and muscle contraction. With its ability to help muscles to relax, maintain a regular heart beat and reduce feelings of anxiety, magnesium has earned a reputation as an anti-stress mineral. 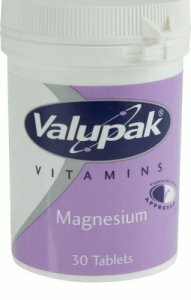 Magnesium activates several enzymes and is important in the conversion of blood sugar into energy. This vital mineral promotes a healthier cardiovascular system and may help to prevent heart attacks. A poor diet may not contain sufficient amounts of this mineral, so these tablets are an easy way to make sure that your body receives the amount it needs to stay healthy. One tablet per day with food or liquid.